Geographical position:	between latitude 45o45' -48o35' North nd longitude 16o05'-22o55' East. The country is located in The Carpathian Basin. It is encircled by the Carpathians and DinaricAlps. Most than 70% of it's area is flat, only in the borders has some hills. The highest peak of the country is the Kékes. It is 1015 m high above sea level. The country has two main rivers Danube and Tisza. Climate:	Climaticaly Hungary belongs to the continental climate. Summer temperature is about 20days/year above 30oC. Winter temperature is some time can reach - 20oC or less. Month I. II. III. IV. V. VI. VII. VIII. IX. X. XI. XII. After the change of regime in Hungary , approximately 90% of the land is given into private hands. The farm size is between from 1 ha -to more than 100 ha-s. This area has many of geothermicwater most of them in use for greenhouse heating. The wells depth changes between 1200-2200m and the water temperature is between 76oC and 98oC. This area has the most glasshouse (80 ha-s) and high plastic tunnels (walk-in-tunnel 1 800 ha-s). Also there are low-tunnels (100 ha-s) and different kinds of simple covers such as agryl or plastic mulch (120 ha-s). 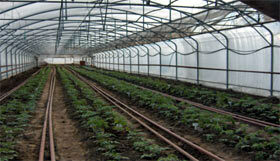 All of greenhouses have heating systems and 30% of hightunnels have it. This area previously has only low tunnels nowadays more and more walk-in tunnels (800ha-s)and greenhouses(18 ha-s) such us Rischel and Filclair (4,2 ha-s). The Eastern part of Hungary nex to the Romanian border (Békés) has 18 ha-s glasshouses, 3,4 ha-s Rischel house and 280 ha-s walk-in tunnels. This area has the most agryl mulch (3800 ha-s). The northernpart of Hungary. It is located 60-70 km far from Budapest.The name is Jászság. Here the most important structure is a walk-in tunnel (1200 ha-s) usually without heating and 2500 ha-s agryl mulch. The southwestern part of Hungary next to the Croatian border (Baranya) has traditional low tunnels (460 ha-s) and 1200 ha-s agryl mulch covering. Thre are 4 different season of protected cultivation in Hungary. - „early forcing": It is growing under walk-in tunnel (double or more plastic covered Fig. 3-4) with different kinds of heating systems. The sowing date is November, December, transplantig is February, March. Harvest season is from April to July. Cultiveted crops: pepper, tomato and different kinds of cabbeges. unheated forcing" All kinds of plastic tunnel used for it. (Fig. 5). The sowing date is February, March it is depend of crops. Transplanting from April and growing season is to November, some time only to August depends the crop price. Cultiveted crops are: pepper, different kinds of cabbeges and very few tomato. - „autum crop" We can use for it a glasshouse and a walk-in tunnel generally without heating, but if the temperature dramaticaly going down possible use some kind of heating system. Sowing date is Jun, July, transplanting August, September. The cultivation period to December. Used crops are pepper, tomato and lettuce. Plastic and agryl mulch are using on open field for protection such as low temperature on different kinds of melon (80% watermelon) Fig. 6. Lots of unheated walk-in tunnel cultivated with carrot and parsley sme times cellary. We have many of years traditional with protected cultivation. The last 10-15 years the farmers use the update varities not only Hungarian breed, but all of varieties of foreign seed company too. That is mean the yield is stabil as you see on the Table 5.
Pepper production: In Hungary we have special Hungarian type „sweet, whithe conical".(Fig.7.) Hundred % of this types were breed by Hungarian Institute or Hungarian private seed company. Also we growing „hot, long" type pepper (Fig.8.) too, before it was also Hungarian breed nowadays some Duth company also have the same type. All to others vegetable varieties 80-85 % come from foreign seed companies.The farmers use year by year the update varieties, because all seed company has representatives in Hungary. They are every year organized some demonstration for the farmers and shows them a new varieties. Hungary has a very good soil conditionseven the areaswhere using a protected cultivation. Growers used indoor greenhouseculture for a long time. As a results of monocultureproduction many problem appeared:soils had poor structure, high level of nutriens and many problem with diaseases. Usually these areas were disinfection different way On one hand by steam (under glasshouses) and the other hand by chemicals. As you know the chemicals is prohibited from 2005. It is mean the farmers have to change a technology. The most biggest glasshouse area and some farmer changed the growing system to soilless culture. (Nowadays 30 ha-s greenhouses have it). This technology need more input (money, knowledge etc.) than usually the Hungarian farmers have. Most protected cultivation area is between 1000m2-3000m2. Some examination shows us under the 3500 m2 of soilless culture is not profitable in this moment in Hungary (by Tompos). Because the energy costs and the others (fertilizer,labor cost etc.) increase year by year and we have lot of cheap vegetable import from the southern countries (Spain, Greece, Italy, Morocco). How to go to the future? In EU producing 54 millions to vegetables from itHungary producing 1.8 millions to (3.5 %). The market is full of ordinary vegetables. We can be valid if we can produce special product (best quality,"hungaricum", etc.) in special time.